31st Auction of Washington Wines Raises More than $4M - Write for Wine: It's Wine O'Clock Somewhere!Write for Wine: It's Wine O'Clock Somewhere! We have been fans of the Syrahs created by winemaker extraordinaire Morgan Lee for years, but we met him for the first time at the picnic; an opportunity to chat with winemakers is one of the many benefits of attending this event. 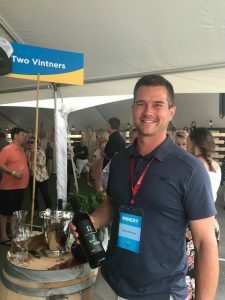 His Two Vintners 2015 Some Days Are Diamonds Syrah was our favorite at the picnic – for its elegance, funky savory notes and a pure, clean mouthfeel. We also appreciated his other pour, 2014 Sal, a lovely reserve Cabernet Sauvignon, named after his wife, Sally. Our other favorite was the yet-to-be-released Fidelitas 2017 Quintessence Malbec that was pretty from start to finish. 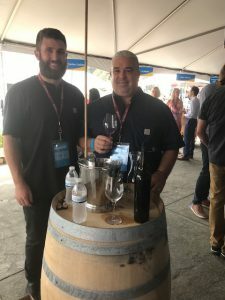 Talented winemaker Charlie Hoppes and his son Will poured this beauty for us – a smooth, delicious wine that might just be the best Malbec from Washington state that we have ever tasted. We also enjoyed Fidelitas 2015 Red Mountain Malbec and 2016 Optu White Wine. At the barrel auction, five lucky winners had successful bids for futures of the stellar Quntessence Malbec. 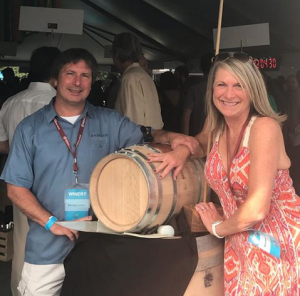 Another standout at the picnic was Barrage Cellars 2016 Columbia Valley Red Wine, poured by creative winemaker Kevin Correll and Bonni. Since we’ve known Kevin, he has always blended his wines using the same grape from various vineyards. But he took a new approach with this yet-to-be-released bottling — 78% Cabernet Sauvignon is blended with 15% Merlot and 7% Cabernet Franc, featuring aromas and flavors of black and red fruits, licorice and dark chocolate. We can’t wait for its mid-September release. DeLille Cellars 2015 D2, an annual favorite that will be celebrating a big milestone with its new release in December. Of note, a trip to Bordeaux courtesy of DeLille Cellars received the highest bid of $160,000 at the Saturday night Auction Gala. Mercer Estates 2014 Eagle & Plow, a beautiful, lush Cabernet Sauvignon that is Mercer’s charity wine, with proceeds going to some great causes. The Walls 2015 Stanley Groovy, a tasty blend of 21% Red Mountain Cabernet Sauvignon and some groovy Portuguese varietals — Touriga Nacional, Souzão, Tinta Cão, and Tinta Roriz (a Tempranillo clone). And we can’t forget the food! The wines were paired with way more than what we consider to be traditional picnic fare. Here were some of our favorites. 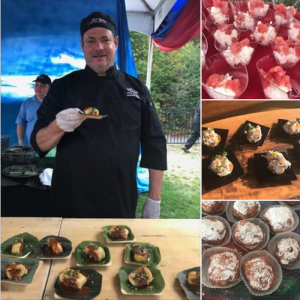 Congratulations to all the wonderful people who work at Auction of Washington Wines, the many volunteers, the supporters and of course, the winemakers and chefs. This entry was posted in Bordeaux Blend, Cabernet Franc, Cabernet Sauvignon, Columbia Valley, Malbec, Merlot, Red Mountain, Syrah, Tempranillo, Walla Walla, Washington, Wine, Wine Events, Woodinville and tagged Barrage Cellars, Bordeaux blend, Cab Franc, Cabernet Sauvignon, Chateau Ste. Michelle, DeLille Cellars, Fidelitas, Malbec, Mercer Estates, Syrah, The Walls Vineyard, Tulalip Resort, Two Vintners, Walla Walla, Washington wine, Washington wineries, wine, wineries, Woodinville by Margot. Bookmark the permalink.